Time to call the Punisher. 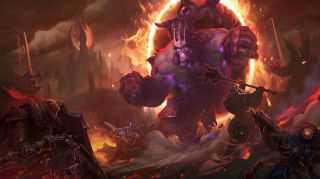 The second Diablo-inspired map in Heroes of the Storm, Infernal Shrines builds upon some of the mechanics at play in the Sky Temple map while adding in its own twist: all-or-nothing objectives. The vast majority of objectives in Heroes of the Storm give some reward to the team that fails to capture them as long as they did something. The next objective might not require as much currency to be cashed in, or the enemy’s resulting minion may be weakened. In Infernal Shrines, that’s not the case. Capture objectives yourself, or feel the consequences as if you had done nothing at all. Three lanes make up Infernal Shrines’ map, with a shrine above each lane. When a shrine activates, teams must kill 40 Guardians—weak neutral monsters that spawn periodically around the shrine—to summon a Punisher, who will barrel down a lane. The difference between the Punisher and other siege units like bosses or Immortals is that the Punisher won’t just attack structures, but will attack heroes directly too. Knowing how to fight Punishers early on as well as the right ways to fight at each shrine are key to victory on Infernal Shrines. There’s an important secondary objective on Infernal Shrines, too: map control. Despite each Guardian being somewhat weak, it can take a couple of minutes or longer to kill 40, especially if a fight takes place to try and contest a shrine. Try to take at least one support character who can keep healing up for that whole time, such as Li Li or Brightwing. While it’s tempting to make a team composition that can clear out the Guardians quickly and therefore secure the objective easily, this is rarely the best option. Guardians spawn in too few numbers in each wave, and they’re just slightly too strong to be killed fast enough for this to be effective. Instead, focus on making a team composition that can control the area around the shrines: a strong front line, a hard hitting back line, and so on. As it takes so long to capture a shrine, Abathur and The Lost Vikings are quite effective at putting one team ahead in experience by hiding in a separate lane. On Infernal Shrines, laning is very much a standard affair. Typically, a solo laning hero will go to the top lane, while either one person stays in the bottom lane and either three stay in the middle or four move between the two as a unit. The key is to stay safe rather than pull ahead in any way. The first turning point in the game typically won’t be in the laning phase, but will be at the first shrine. Once a shrine activates, one player must interact with it to prompt the Guardians to spawn. A counter will appear in the bottom right of the screen to indicate how many Guardians each team has killed. Don’t underestimate the Guardians: while they are weak on their own, over some time they will do some damage, and some heroes with a low health pool can struggle to clear Guardians alone. Warriors are typically the best bet for killing Guardians. For the first shrine, figure out if your team wants to contest it and don’t be afraid to sacrifice it in favour of soaking experience from lanes. As the team that doesn’t capture it gets nothing, even if they killed 39 Guardians, don’t waste time if it looks impossible. Cut your losses and get experience. The most important thing isn’t to kill Guardians, but to control the area. Each shrine has a different layout: let’s go through each one and how to control it. The top shrine is the most closed-off, only having entrances towards the bottom side, two of which have vision-obscuring smoke. If you get there first and can assert control, have one hero sit in the smoke towards the opposite team’s side of the map. They will offer vision control, so there’s no surprise attack from the enemy. Ambushes can be deadly, as it’s easy to get cornered towards the upper walls and caught. If the enemy is controlling the shrine at this point, clear out the minions in the top lane. This will remove some of the enemy’s vision around the shrine and allow you to flank through their side of the fog entrances. With a few more ways in, the middle shrine can’t be so easily defended. The best option is, typically, to have a front-line warrior towards the upper left side of the shrine. They should act as a meat shield, preventing the enemy team from approaching through that entrance, and allowing for them to collapse on anyone that tries to attack from the top. The weakness is, as with the top shrine, minion vision. The controlling team will rely on minions to see what’s going into the fog, so to attack, clear the minions quickly and use the brief darkness to mount an attack through the fog. Finally, the bottom shrine requires two people to defend the top and enemy team’s sides. With a fog bank on every side, it’s incredibly difficult to defend this shrine effectively, and ranged heroes can use the areas around the crystals on the upper corners to siege the inside. To effectively defend, the best option is to go aggressive on the enemy at any opportunity and force them to recuperate. Using the open nature of this shrine is the best way to retake it, coordinating an attack when the enemy has abilities on cooldown from clearing Guardians. Watch where they’re defending, and take advantage of an empty entrance. If you’ve managed to capture the shrine, well done! Send two allies away to soak experience from other lanes while the three remaining heroes push with the Punisher. The aim should be to take advantage of its aggressiveness against heroes, the guaranteed stun of its leap offering a good opportunity to take out an enemy. While the Punisher attacks structures, do the same, using it as a big meat shield against forts, towers, and keeps. There are three different kinds of Punishers, indicated on shrines and by their abilities. Each one is treated the same, though: avoid their lasers/freezing bombs/mortar fire. If you’re facing the enemy Punisher, there’s one key trick: force the Punisher to leap over a gate when it tries to stun you. Because there’s a cooldown on its leap attack, let it walk up to your structures while you sit behind the gate, then attack it. You’ll be safer from the enemy behind your structures, and from here the fort or keep will be able to attack the Punisher, killing it quickly. Punishers are stupid and unreliable. Even so, they’re fantastic at soaking a lot of enemy fire and well as distracting foes. They’re not quite the game-winning reward that Immortals can be, but successive Punishers will eventually raze enemy structures with your help. Control the map to keep summoning your own Punishers and whittle down enemy forts. If you’re behind and need to claw a victory back, your best bet is to set up an ambush around the shrines and pre-empt the enemy’s attempts to control the area. If you’re already set up, a good combo of abilities in the lategame can put enemies on death timers long enough to give you a free Punisher. Finally: mercenaries are very much your friend. Capture them just before a shrine spawns, and delay it. Distract the enemy, create back and forths around the shrines, just to let your mercenaries do their work on enemy fortifications. Sometimes, it can be good to take a shrine slowly, if you have minions chipping away at an enemy structure. Control is the name of the game in Infernal Shrines, not just power!